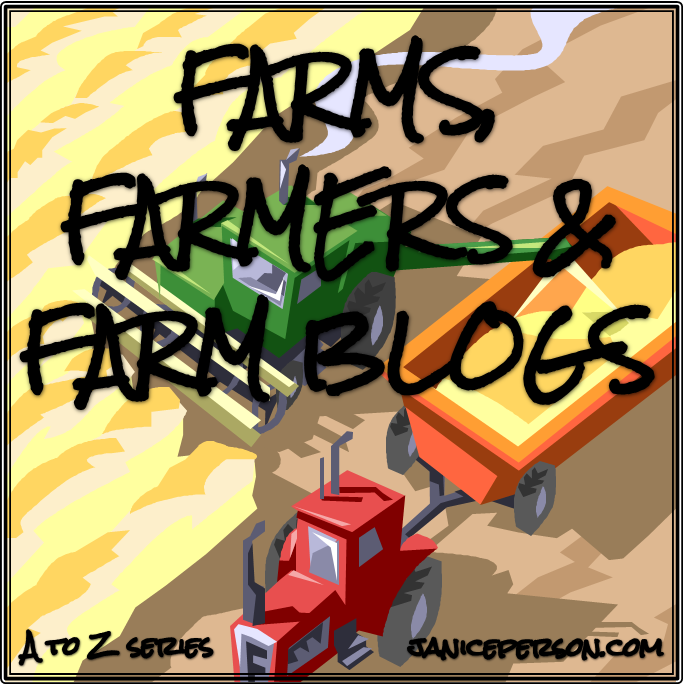 When I looked at the two farms for Z, the words care and understanding came to mind. The photos for today really show that connection to the animals in the care of these farmers on a couple of family dairy farms. Some of you may have remembered my visit to an organic dairy my friends Tim & Emily Zweber run with Tim’s family. Zweber Farms is just outside of Minneapolis in Elko, Minnesota. The Zwebers sell the milk from their farm under the Organic Valley label. They also raise cattle for beef, pigs for pork, and chickens for eggs and meat. We sell our meat and eggs directly off our farm and friends say it is awesome. Our farm is completely surrounded by housing developments. When our farm was established in 1906, Great Grandpa Zweber could have never imagined that Minneapolis would eventually reach his doorstep. Our location gives us a unique opportunity to meet with our customers everyday. Tim got his start in farming when he was born. He is the fourth generation to farm at our current location. He can trace back ten generations to a farm in Germany. When I was in upstate New York this winter, I finally met Jessica Ziehm, someone I had know through Twitter for years because she runs the New York Animal Agriculture Coalition & its @nyanimalag accounts. 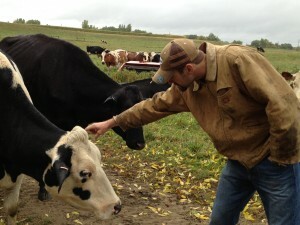 Later in the winter I also met her husband and learned a bit more about their family dairy farm. Every farm is unique because no two farms are alike. 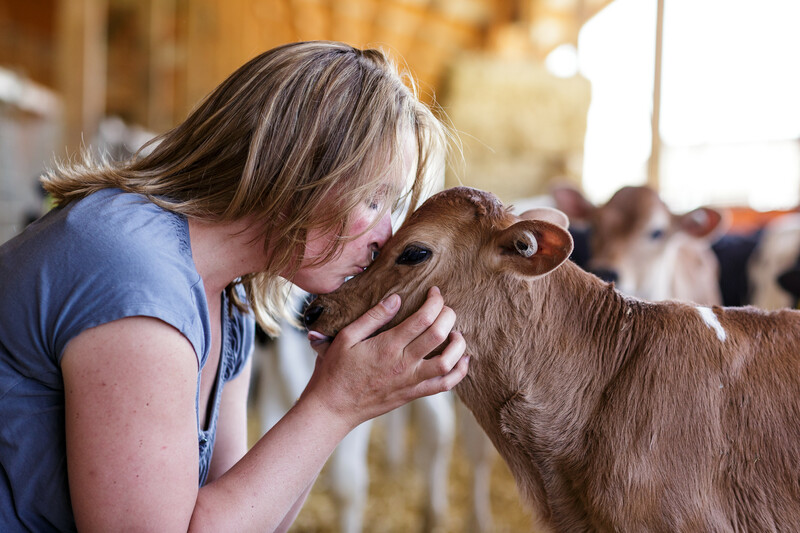 Dairy farming is a lot like parenting – it takes a whole lot of love, energy and all your time, it is immensely rewarding and there’s no one way to do it. That’s because every farm has a different set of circumstances, different animals, infrastructure, resources and situations. However, every farmer strives to do his or her best when it comes to caring for their cows. The cows always come first! And they have to because as their caretakers, that’s our job. I am a 4th generation dairy farmer’s wife. I grew up on her parent’s dairy farm of 85 Jersey cows (the little brown ones) and today, lives on my husband’s family’s farm where they 900 milk cows. Growing up I knew I wasn’t cut out to be on the farm every single day, but found my passion when I served as the New York State Dairy Princess. In that role, I was introduced to the world of advocacy and recognized the need for better communication between farmers and consumers. I have worked in numerous roles in the agricultural industry, including promoting milk in schools, selling livestock feed, working for Farm Bureau and serving as the spokesperson for the state department of agriculture. Today, I serve as the executive director of NYAAC and stays busy raising the 5th generation on our family farm. I also run our annual pumpkin stand. One of the best things about dairy farming in New York is that we are truly a sustainable business – and that doesn’t have anything to do with farm size or management decisions. We raise cows who provide us milk, but that’s not all. Dairy cows also produce manure – lots of it! While some people outside of the dairy industry may consider that a waste – it isn’t! Manure is an amazing fertilizer that we apply to our land. Manure helps put nutrients back into the soil and helps us grow outstanding crops like hay, corn and soybeans that are fed to our cows. Good feed for our cows helps them produce high quality milk. And as stated earlier, cows gives us milk and manure – so the cycle starts again. The Final Letter is Done! The cycle, cow gives us milk calves and manure. Calves give other cows and more manure. Manure grows the food we feed to our cows. great article, Lovely breakdown. Thank you.